Back in May I got my upgrade, in the end I opted for the Samsung Galaxy S II. It’s on Vodafone, 12 month contract, £49 up front, £50 a month (minus a nice staff discount). 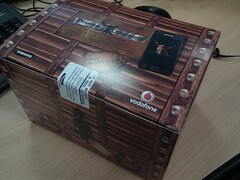 The phone came with the first three Pirates of the Caribean DVDs (no idea why), and amazingly my phone was unbranded out of the box (all others appear to have light Vodafone branding). So what to say about this phone. The screen is amazing, can view it at any angle, brightness strong enough for reading text messages outside and blacks are black. The video player was happy at the 1080p 5.1 MVK file I threw at it, the 720p Doctor Who episode was perfect with no visible dropped frames. The 8mp rear camera takes some great shots and the front facing one will be good if Skype get their arse out of gear and release an Android app for video calling. Being an Android phone, it was happy at downloading all my previous apps over-the-air, and coming from the Nexus One had no learning curve jump to make. Pretty quickly I replaced TouchWiz with ADW.Launcher (had this from CM7 on the Nexus). I installed the Clock from Froyo (tweaked by CM), which was backed up from Titanium Backup as I preferred the night mode. Otherwise I’m still using the Samsung Browser, Calendar and Dialer. The battery tends to get me to the end of the day, but I do find myself spending a lot of time in the evenings playing with it. Worth keeping a spare charger at work and in the car. 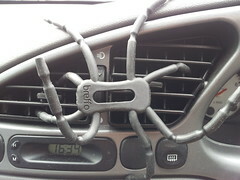 The Breffo SpiderPodium is my in car holder. A USB OTG cable or adapter to plug in keyboards, mice, USB sticks, portable hard drives (mixed success on which ones do work, as if they draw too much power the phone just warns, external power supply for hard drives is useful). An MHL Cable to mirror your phones output to the screen of your HD TV.